Another hometown connection has been prominent lately...I've been reading Landscaping the American Dream: The Gardens and Film Sets of Florence Yoch : 1890-1972 , which was written by Florence's nephew James Yoch, who is the only other garden historian I know of from my home state. We chattered on last year at a charity dinner; one meets so few fellow garden historians that there is always too much to say and too little time, and really all that is known about Florence Yoch is contained in his book. 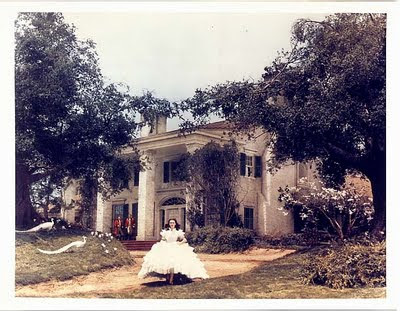 Working in Pasadena and West L.A. in the 1920s and 1930s, Florence designed the landscape of film mogul David O. Selznick's home as well the landscapes of some of his greatest movies, most prominently the garden setting of Tara in Gone with the Wind (1939). I'd never thought about its landscape before knowing she designed it, which perhaps speaks to how well she captured the blend of rusticity and refinement that characterized the great country houses of the American south. Nothing jars; the design is so appropriate that it disappears. Like all of her movie gardens, the landscape of Tara was created on a studio set in Hollywood, not on location. 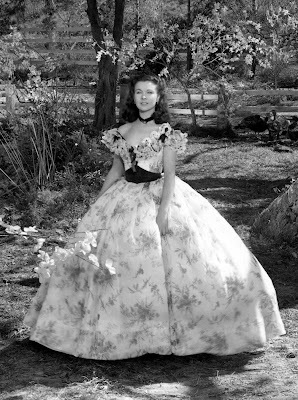 Florence went to Georgia in preparation, to study its native plants, and then worked "to take California trees, shrubs and vines and do tricks with them so as to make passable likenesses to Georgia trees, shrubs and vines". The budget for the garden installation was $16,000, an astonishing sum for the final years of the Great Depression. She also created the desert oasis of Algiers in The Garden of Allah (1927)--traveling to North African to record authentic details like 'huge blue agave silhouetted against sand wash'-- the farmlands of China for The Good Earth (1927), and produced 10,000 daffoldils in simultaneous bloom in a fictitious Welsh forest for How Green Was My Valley. Her use of assymmetrical masses of plant material to frame a scene as well as her attention to changes of level in the ground plane was brilliant in both her movie sets and her real-life landscape designs. 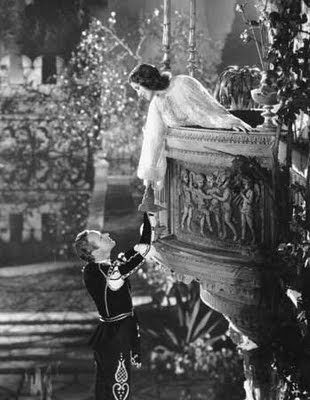 To even her vision of Tara, though, I prefer her landscapes for the 1936 version of Romeo and Juliet: Italianate ruins in a meadow outside Verona, the cypress adorned cemetery of the final tragic moments, and the enclosed garden of the Capulets where the balcony scene speaks its wherefores. Here, she wisely deviated from the expected garden of clipped and formal historic proportions and instead turned to the balanced assymetry that was her special talent, using a pair of unmatched canals and 'including a single urn, a statue, and a freestanding column [to] suggest the singularity of the lovers'. I was unable to find good photos of these sets, though they're included in the book, so I recommend you curl up and watch the movie this weekend, as I will be. Have a lovely one. Agnieszka Holland's 1993 version of 'The Secret Garden' was one of my favorite movies growing up, partially because of the beautiful garden they used for the filming. I know that Allerton Castle and Fountains Hall in Yorkshire were used for shots of the manor, but I don't know what they did for the garden... I'd love to find out. I like the rambling somewhat overgrown garden in Howards End. I my mind it is what I think of when an English cottage garden is mentioned. 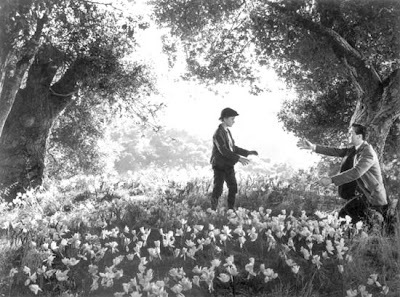 The garden from, Something's Gotta Give. Oh my. It does it for me. Thanks so much for this post. I will have to look up the book. I do quite a lot of research on the gardens represented in set designs for opera (mainly 17th and 18th century), so I am naturally intrigued by gardens in film, but have never quite gotten around to reading up much about it. is interesting to look at how they were depicted in film. Will have to watch that Romeo and Juliet now. Garden history... what's better than that!